Senator Scott Wilk, R-Santa Clarita, honored Advanced Audiology as the 21st Senate District Small Business of the Month for August. Wilk presented the award to audiologist, philanthropist, and founder of Advanced Audiology, Nola Aronson. With nearly four decades of audiology experience, Aronson has not only helped the people of Santa Clarita overcome hearing loss, she has a long history of community support in the region. She recently made a generous donation of books to the local Boys & Girls club in addition to presenting a $2,500 check at the clubs 46th annual benefit auction. Aronson was also a sponsor for both the 2017 Walk to End Alzheimer’s and the Circle of Hope Afternoon Tea, A 17-year breast cancer survivor herself she applauds organizations like Circle of Hope for helping people like her who have battled cancer. 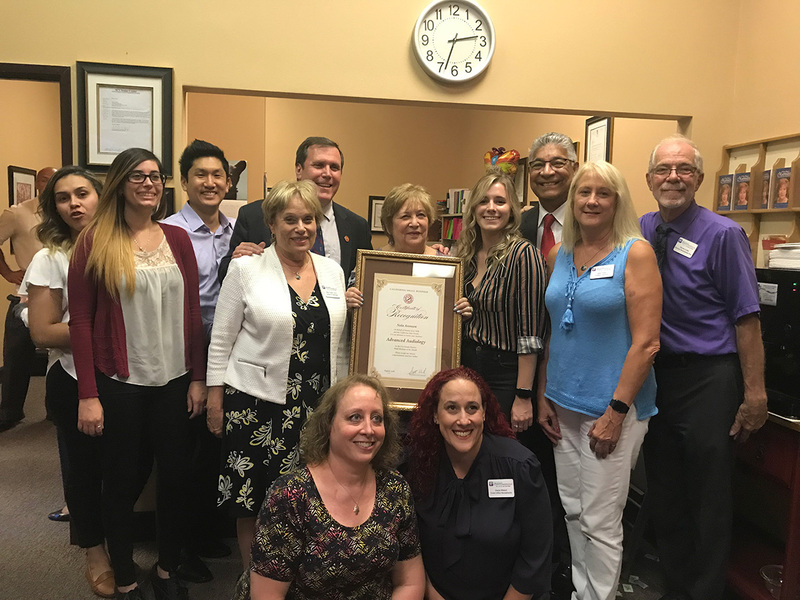 Advanced Audiology is the largest diagnostic hearing center in the Santa Clarita Valley, and has been assisting residents of the region since 2010.